COPPER | Gescina The Chemistry of Nature Inc. PURE COLLOIDAL COPPER- “SECRET FOR EXTENDED YOUTH & LONGEVITY”? Copper is another irreplaceable catalytic element, metal, mineral supplement, vital structural part of the human body. 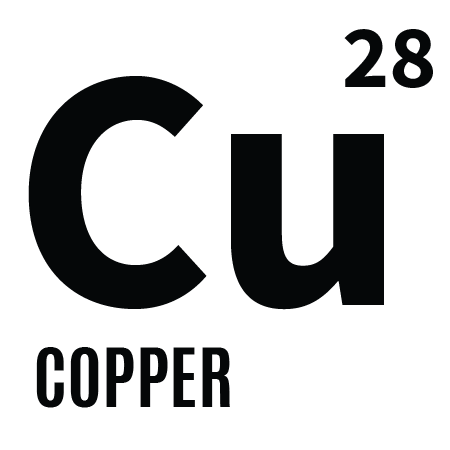 Copper is used in medicine and cosmetics within several thousand years. Legends say, Solomon gifted the queen of Sheba Copper powder to preserve and improve the beauty. This powder was used as an ointment for face and body. Same said about Cleopatra and Nefertiti, which legends say been women of extraordinary beauty. But this powder can’t penetrate deeper to other organs and be consumed orally. Copper makes tremendous amount of various work in the human body, that difficult to name all. Current science admits, that the healing power of Copper capable to provide outstanding results that are non-comparable to traditional medical means. All properties of Copper are not explained clearly even today, but practical usage of colloidal solutions and applications is increasing daily. Usage of colloidal Copper is easily combined with active ingredients- Vitamins, other minerals, specific organic food additives. One suggestion, it should be between 1 to 4 mg. To note, that about only 30 % food Copper is properly digested in human bodies. Today, due to technologies based on electrolysis, we have available Copper as pure colloid. Copper particles obtained through a colloidal process, are extremely small (2 to 100 nm) much smaller, then pores of skin and membranes. Nano-particles of colloidal Copper easily move throughout the body, provide necessary portions and do not cause any toxicity, like compact powders of heavy metals. Beyond colloidal form, Copper widely used in compact metallic form for many external applications. China, Russia and Israel still carry most of those technologies with metallic Copper, copper-clothing, disks, wires and other. Bottling: amber/green glass bottles- 500 ml [by request- 1,000 ml]. For general maintenance level of Copper in the body, one may need to drink Colloidal Copper 4-5 times a year. It is safe to use 50 or 100 ppm colloidal Copper. One 500 ml bottle, suggested for one full course, drink everyday till finished. In cases of existing chronical diseases, consumption of Copper should be increased- get advice from naturopaths. Copper colloid: Easy to drink: 1 to 3 table spoons a day, regularly, separate from food, for 30-40 minutes. Some food supplements, can be mixed with colloidal Copper. *Exclude Iodine and Iron supplements, when taking colloidal minerals.